As with the previous New Acquisitions, this story had been made and edited over a year previously and held in store for lean months. With the news of Tennant's departure, the time was right to give these stories their air time. 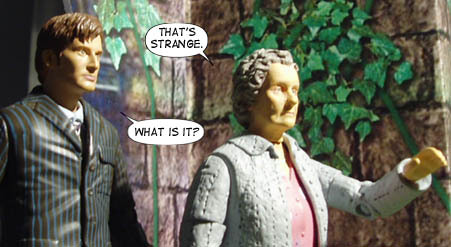 As with many AFT stories these days we are governed by what figures are available- in this case an almost generic old lady figure and some scarecrows. Throw in a village church and you have all the ingredients for a quaint English Doctor Who story. 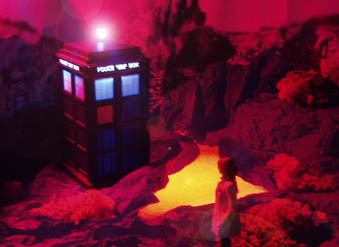 So quaint it was originally going to be a 5th Doctor story. 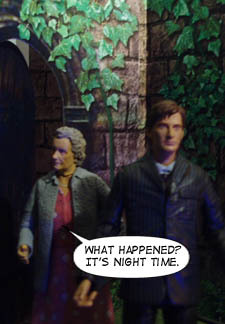 But with the 5th Doctor figure still months away it was decided to give the story to the tenth Doctor. At the time (late 2007) the Doctor was between companions. Martha had gone and Donna was on the horizon so it was fitting that the Doctor was alone. Now, over a year after the story was made, I have moved it to post series 4 at a time when the Doctor is reflecting on those he has lost. With the script completed on 19 December 2007, shooting began on 21 Jan 08. The church set was built in its entirety (inside and out) and the grave yard scenes were shot first before moving to the interior. The final scenes with the church in ruins were shot on 24 Jan 08. An as-yet-unposted Harry Potter AFT story was shot back to back with the church set doubling as a museum and part of Hogwarts. There are no plans just yet to complete and post this story but with the upcoming movie, that may well change. 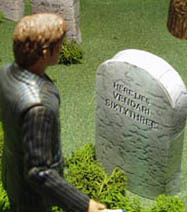 The grave stone that the Doctor is looking at was originally going to be that of Vendari 63- our AFT companion for the 8th Doctor. It's been established that she does die but the exact circumstances have never been revealed- basically because I haven't decided them yet. When it came to the finished story, the appearance of Dari's grave out of nowhere seemed too random so I changed it to make it less specific. At the time I did it, the exact fate of Rose was undetermined so it could have easily been her grave. This story is very much stand alone. The reflective nature of the Doctor has particular resonance when placed after Journey's End or Planet of the Dead where the Doctor is alone and contemplating staying that way in the light of those he's lost- but it makes no links with any TV adventure. This is the last story with the tenth Doctor before we begin our epic finale (coming in July). I think the 10th Doctor has been fantastic and we intend to send him off in some style. 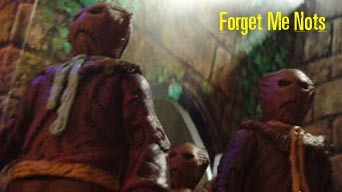 As a teaser, to the left is an image from the first episode called Firetrap. Yes, that's Sarah Jane in the foreground.